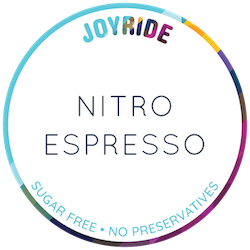 Joyride is more than just office coffee —we strive to be tastemakers and leaders in our craft. We search for the best and most innovative artisanal beverages in the country and make them available by the keg at top-notch offices, cafes, restaurants and more. Below you'll find Joyride's current portfolio of cafe and office coffee keg products, an enviable list that we are extremely proud to offer our customers. Mouse over the below images to check if these products are available in your area. Our hand-crafted cold brew coffee is made using our proprietary method for perfect extraction. Our cold brew is simply unrivaled in quality, accented by velvety smoothness and fudgy notes, with no trace of bitterness or acidity. Brewed to perfection, the components of our green tea are organically-grown on a family-owned farm in Shizuoka, Japan. Utilizing the quintessentially Japanese Yabukita cultivar, this tea exhibits notes of apple and a sweet, rounded finish. Our Scarlet cold brew is a lively, tart and fruity blend of hibiscus and linden flowers. Caffeine and calorie-free, this herbal infusion casts a brilliant ruby red hue from the infused hibiscus. Particularly refreshing when served over ice! From the coffee masters at Intelligentsia, this cold brew pairs easily with extravagant breakfasts, spicy dishes, and mixology adventures. Or, simply enjoy it poolside on a sunny afternoon. Kegs are available exclusively from Joyride. With the newest member of the Joyride family comes a cold brew that exceeds expectations. This full-bodied coffee is accompanied by sweet chocolate notes and a crisp finish. It is the perfect companion for a warm day in the sun. Stumptown starts with the highest quality coffee, cold brews it without heat for over 12 hours, then uses a double filtration process to procure the end result: a complex, smooth, and full-bodied brew with low-acid and a chocolate finish. This uncompromising Kombucha comes from the heart of San Luis Obispo, CA. Thanks to native strains of bacteria and yeast, Whalebird Kombucha is refreshing, while maintaining low sugar, strong culture, and beneficial organic acid. Perhaps the cleanest cold brew on the market. Armed with a kick of caffeine and a Guinness-like cascade, RISE will brighten your morning and keep you going all day. RISE features its signature cascade. Simply put, in the coffee world George Howell is a living legend. Now, for the first time, there is a cold brew that lives up to the name. With notes of chocolate and citrus, this world-class coffee will be available first at the Boston Public Market. Using a special blend of coffee that is cold brewed to perfection, this amazing cold coffee is infused with nitrogen and served on draft for a milky mouthfeel and a magical cascade. A perfect option for both offices and cafes. Locally produced and filtered by state-of-the-art equipment in our breweries, Sustainable Seltzer is the ultimate bottle replacement, removing up to 80 bottles from circulation per keg. Save money & the environment by the keg. Our one-of-a-kind Matcha Nitro Cold Brew tea is full of Amino Acids, Antioxidants, Chlorophyll, and L-theanine, providing a unique brothy or savory (umami) flavor to green tea infusions with an alert and calming effect with a leveling caffeine output. Looking for a chocolaty cup of coffee heaven? Equator cold brew, on tap at both their Mill Valley and Market Street cafes, has your name on it. With Equator's strict quality standards, this is a coffee to satisfy even the most refined palate. Starbucks® Cold Brew shows up with remarkable sweetness and roundness, which is exactly what Starbucks was looking for when developing this unique Cold Brew. Available in ready-to-serve and nitro cold brew kegs from Joyride. Currently served on tap at their Valencia Street and Napa cafes, Ritual's cold brew embodies the company's relentless quest for quality - made from a special blend that is selected by their QC team and brewed to perfection by Joyride. Hand-crafted the "old-fashioned way", Health-Ade does everything possible to guarantee the best brew out there. Made in super-small batches for ultimate quality, it is flavored only with raw, cold-pressed juice from organic produce. Vegan, gluten-free and non-GMO, GT's Kombucha has set the standard for kombucha for the past two decades. Their dedication to quality has created one of the sought-after brands in the beverage world today - now available from Joyride! A new cold brew version of the traditional espresso experience! At roughly double the strength and caffeine level of a standard cold brew, it should be enjoyed more like an espresso. Enjoy as a shot or as an espresso based drink. A search for the finest teas on the planet led us to create a truly immaculate cold brew iced tea. Made with only the best estate-grown Ceylon tea leaves, this tea is balanced and brisk, with a clean, honey-like sweetness. Developed alongside the coffee connoisseurs at Sightglass, this cold brew collaboration has yielded an impressive libation, with notes of fruit and chocolate. It's the perfect companion during a morning of relaxed contemplation. 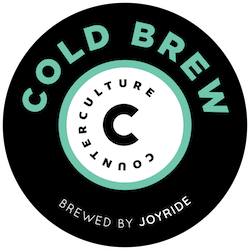 With Counter Culture's long history as a leader in the world craft coffee, it's no surprise they are working with Joyride to push the envelope with cold brew kegs. An exquisite brew, it's one that will leave your tastebuds begging for more. Swizzle began in the mountains of Vermont hundreds of years ago. Up-Mountain has reinvented this age-old recipe to be the most versatile health drink around. It has a kick without the caffeine and offers an array of health benefits. Grady’s Cold Brew is a New Orleans–style (NOLA) coffee that’s brewed and bottled by hand in Brooklyn, NY. Cold brewed with chicory, it's is a bold, velvety-smooth coffee that can be mixed with milk or water—served over ice or steaming hot. With a mission to be the specialty coffee and tea partner of world-class establishments, LAMILL has collaborated with Joyride to produce a cold brew that fully embodies that ethos, with a truly fantastic cold brew coffee. This immaculate cold brew is brewed using Segafredo's Brillante – a blend of beans specifically selected to be brewed without heat. Featuring notes of citrus & chocolate, this cold brew boasts a smooth, crisp finish begging to be savored.